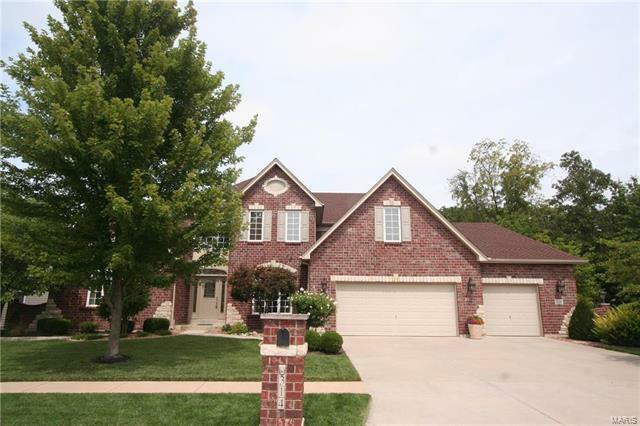 Beautiful brick & stone 1.5 story in sought after Manors at Quail Ridge. Private 40x20 in-ground salt water heated pool with new liner (2015), pump motor (2017), and winter cover (2017). Large stamped patio with outdoor fireplace, hot tub, and lighting. Oversized 3 car garage with 5 foot extension. New carpet (2017). Two story entry foyer. Den with vaulted ceilings, french doors, & built-in bookcases. Two story great room with fireplace, 18' ceiling, balcony and wall of windows. Cozy hearth room with fireplace and bay window. Gourmet kitchen with with Cambria counters, custom Cherry Arch Butterscotch cabinets & stainless steel appliances. Big master suite with coffered ceiling, luxurious bath, & bay window. Finished lower level with media room, game room, fireplace, and wet bar. Professional landscaping. Outdoor accent lights. New architectural shingle roof (2016). New water heater (2016). Back yard block metal fencing with 2 gates. Hardwood floors. Quick access to 40. Family friendly.